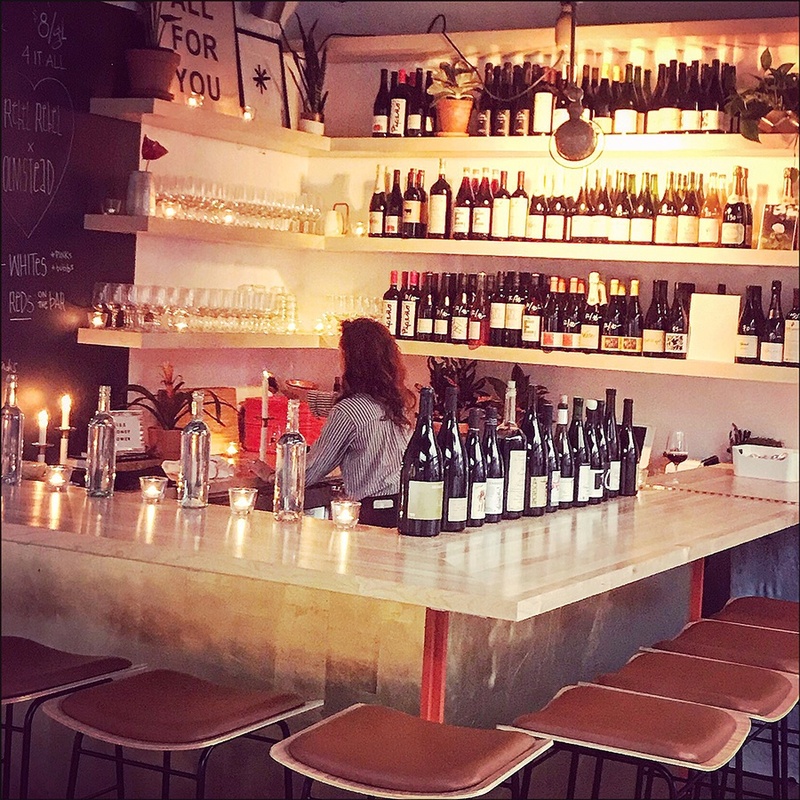 Just in time for the leaves to start falling, there’s a warm and welcoming new wine bar in Somerville. Rebel Rebel officially opens tonight at Bow Market. The ownership debut from Boston wine pro Lauren Friel, Rebel Rebel is centered on offbeat, natural wines, with a constantly changing selection of by-the-glass pours listed on a chalkboard menu. Friel is a consultant who’s managed wine programs for the likes of Oleana, Committee, Michelin-recognized Dirt Candy NYC, and chef Rachel Miller’s Nightshade pop-up. She is also a freelance writer in the food sphere. Local art hangs in the bar, and Rebel Rebel will be the only Boston shop carrying Hassla Books, a New York-based publisher of art books. Musically inclined friends of the proprietor (including Bow Market’s Best of Boston record pros at Vinyl Index) will be curating the playlists. Friel and her boyfriend gold-leafed the bar themselves, and candles add to the room’s cozy glow. Friel kept the design focus on the juice, though, with a wine wall displaying the labels that Rebel Rebel has in-house. For guests who are interested in “nerding out” more about wine, Rebel Rebel will host classes every Sunday from noon-1 p.m., beginning this Sunday, Oct. 7, with Natural Wine 101. The classes won’t always zero in on wine, but sometimes will bring in a local honey maker or coffee roaster, for example; or offer Tarot readings and wine pairings. Friel has hired Grace Wexler, an award-winning former barista at 3 Little Figs; and Maia Fleming, who will split her time behind the bars at Rebel Rebel and Sarma, where she first met Friel. Both employees will also teach some classes, Friel says. The chalkboard menu has a few small snacks, like olives and Bonilla a la Vista patatas fritas (a cult-favorite Spanish brand of crispy, olive oil-fried potato chips, sold at Formaggio). Friel will also suggest pairings with snacks from other Bow Market vendors. This week, she’s hoping to pop bottles of Champagne to celebrate her grand opening, and offer alongside oysters on the half-shell from Hooked Fish Shop, which just opened in late September. Rebel Rebel opens Monday-Friday from 4 p.m.-midnight, and Saturday and Sunday from noon-midnight. 1 Bow Market Way, Union Square, Somerville, rebelrebelsomerville.com.